In early March 2019, Google rolled out a major “core update” that caused some websites to see an increase in search traffic while other sites declined in traffic. What is the March 2019 Core Update? What changes occurred and what can website owners do to optimize their site for search traffic going forward? Here are some details about Google’s March 2019 Core Update including what it is and action steps you can take so that your site gets more search engine traffic. Google launched a big core algorithm update on March 12, 2019. Danny Sullivan from Google confirmed that an update occurred in a tweet on March 13. The marketing community previously referred to the update as the “Florida 2” update because the update happened close to the time of the popular Pubcon conference in Florida. 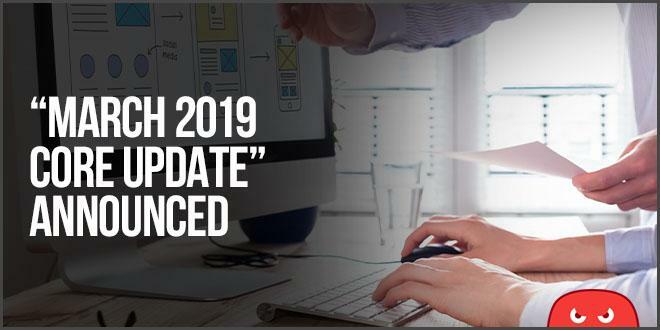 However, Danny Sullivan later announced in a tweet that Google would name the update the “March 2019 Core Update” to avoid confusion. Some marketers speculated that this update reversed changes from the Google Medic update from 2018, which largely impacted medical, health, and fitness websites. The reason for this speculation is that many webmasters that previously saw a drop in traffic from previous updates reported seeing their traffic levels increase after this update. However, analysis of website traffic data appears to suggest that this update is independent of the previous update and is intended to reward sites that focus on providing a good user experience. Google does not typically provide details about what they changed when they release an update. But the SEO community usually figures out the most important changes by conducting their own research and data studies from live websites. Let’s take a closer look at what happened in this update and which websites were affected. Eric Lancheres from Traffic Research ran a thorough study using over 1.7 million search results, data analytics tools like AHrefs and Scrapebox, and 58 Google Analytics accounts to determine the impact of the March 2019 Core Update. Average word counts for high ranking articles and keyword phrases in a web page’s title tag remained consistent, which suggests that these on page factors were not affected by the update. Many sites that experienced traffic drops from the previous Medic update saw an increase in traffic, but not a full recovery. However, some sites did see a full recovery. The Medic update appeared to negatively impact sites that over-optimized for SEO by doing things like having too many instances of keywords in their navigation links or too many keywords on the page. Sites that provided good content and good user experience could see a full recovery, despite over-optimizing for keywords. Google now appears to be willing to ignore over-optimization if the user experience is good. Sites that saw an increase in search traffic and rankings also had a higher average page load speed than before the update. The Traffic Research study also found that sites with too many advertisements or excessive pop-ups suffered a search traffic decline after the update. The reason for this decline is likely due to the negative user experience that these sites provide. Another thing that can negatively impact user experience is large drop-down navigation menus that show up on some e-commerce sites. These large menus can block visitors from viewing the rest of the page and can be particularly annoying if people hover over them by accident. This update also appears to have reduced traffic to sites filled with low-quality content. Prior to this update, publishers could create low-quality content and hire cheap writers to research and create the content quickly and inexpensively. Google might be taking other factors into account like bounce rate or dwell time to determine if the content is good. Another important finding is that sub-domains could see a drop in traffic while the main domain is unaffected. For example, if your blog is on a sub-domain and the content or user experience are not good, then that sub-domain might see a traffic drop while your primary domain stays steady. This update did not appear to apply any new penalties for linking practices. However, the number of total links to pages ranking on the first page of Google went down slightly although the total linking power remained the same. The decrease in the total number of links suggests that getting fewer links from higher authority domains can have more impact than getting lots of links from lower authority sites. Another interesting finding was that backlinks from .gov sites increased by nearly 2.5x for pages on that ranked on page one in Google while backlinks from .edu site decreased slightly. This trend could suggest that Google is giving more weight to .gov sites as these links may be harder to get. Jeff Coyle from Market Muse also conducted his own data study and discovered some useful information for content marketers. In the past, some website owners that had content sites that experienced a decrease in traffic from previous updates could re-launch their content by moving their articles to separate domains. This tactic worked well over the past 18 months, but the recent update appears to have caught on to this tactic resulting in a decrease in traffic to such sites. The Market Muse study examined search traffic to long-form list posts. The idea of creating really long list posts grew in popularity over the past few years due to studies showing that long content tends to perform better in the search engines. However, excessively long content isn’t necessarily good content even if people are more likely to link to it and share it. An example of a really long list post article might be something like “101 Places to Visit Before You Die”. Some list posts showed an increase in traffic while others experienced a decrease so the data from this study is inconclusive. However, Jeff speculated that the articles that experienced an increase in traffic might have attracted enough links from authority sites to offset any penalty from the recent update. Another important finding was that publishing regularly appeared to help sites maintain their traffic levels after this update. Creating content regularly allows websites to keep their readers engaged which enables them to send positive signals to Google, including links, social shares, comments, and website visits. Sites with lower quality content that also did not publish consistently faced the largest risk of traffic decline. Publishers that got lazy sometimes just updated and republished old articles without creating any new content. However, this strategy now seems riskier than before. Google doesn’t usually tell us what the exact changes are when they roll out a new update. Luckily, other marketers have already analyzed data on how this update affected other websites. From what we have seen so far, here are some action steps that you should take to make sure that your website performs well in search after the most recent Google update. Perhaps the biggest takeaway from Google’s March 2019 Update is to make sure that you create a good user experience for your website visitors. You still need to get links and do on-page SEO, but creating a site that is user-friendly is becoming increasingly important. Limit pop-ups and ads even if you are running an affiliate site. Focus first on creating a good user experience and check metrics like your bounce rate, time on site, and pages visited to be sure that visitors are engaged with your website and your content. Basically, remove anything that will make a user hit the back button to look for another search result on Google, including things like slow loading pages and poor navigation. Tactics like doing email outreach to lots of sites are popular tactics for link building, but you may be better off trying to get fewer links from high authority sites instead. And if you can get links from trusted .gov sites, those could help you even more. Most content creators know that being consistent and maintaining a regular publishing schedule is important. But many fail to stay consistent due to the time and resources required. After the March 2019 update, staying consistent with publishing appears to be more important than ever. Be sure to not only update old content to keep it fresh and interesting to your readers, but also create new content on a regular basis to keep people engaged. Also, make sure you are investing in creating high-quality content. Google appears to be cracking down on tactics like creating a high volume of low-quality content and getting links to it through aggressive SEO as well as long list posts that readers don’t actually provide value to the reader. Some marketers are always looking for an easy way to trick the search engines or create a fast fix for their SEO problems. Over the long term, Google always seems to catch on and such sites get penalized. Splitting old sites into multiple domains and re-launching the content does not appear to work well after this update, so avoid using this tactic. Instead, focus on creating good content going forward and updating older content to make it more relevant and interesting. One way that Google likely helps determine if search results are relevant and interesting to searchers is if people click on the link. Test out different title tags and try to improve them so that users choose to click on your link rather than competing search result pages. Overall, Google’s update appears to focus on user experience factors. Links and on page factors are still important, but be sure to spend resources on creating quality content and making sure your website is user-friendly. What have you seen on your end? Let us know in the comments! Hello , Thank you so much for such a wonderful content. it would be very useful for me . Thanks for amazing suggestions. I would love to implement your tips on our website.